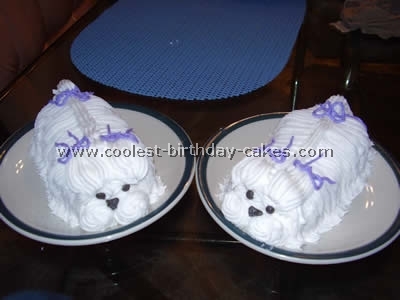 Shown here are two kinds of diaper cakes I’ve made, each with a different theme. 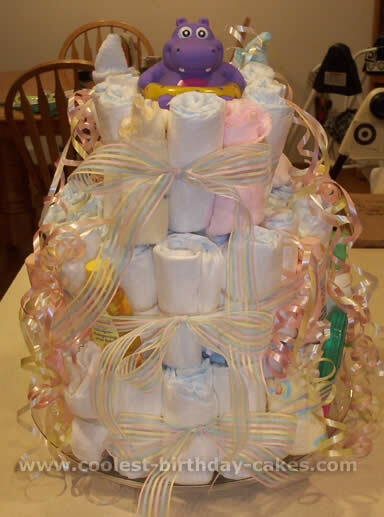 To create a diaper cake like this, you start with a 55 package of Size 1 diapers and roll them each individually, and rubber band each one (I think Pampers Swaddlers work the best). Get a 12" plastic plate and put 20-23 of the diapers on the plate – this requires another set of hands to get them all to stand up, and then you tie a ribbon around them. Place 16-18 on the next layer and tie together, and then use the rest on the top and final layer. "Garnish" with whatever you want – baby spoons, bath supplies, teethers, washcloths, etc. The ideas are endless!! I made this diaper cake as a gift for my sister’s new baby. It was the first time I made one and it could use improvement, but I was proud of myself anyway! I used a jumbo box of size 1 diapers, with a few to spare. Tied it up with some lace I had and hot glued some baby decorations on. Hopefully the next one will look a little more professional! My sister-in-law and I threw a winter baby shower for our other sister-in-law. 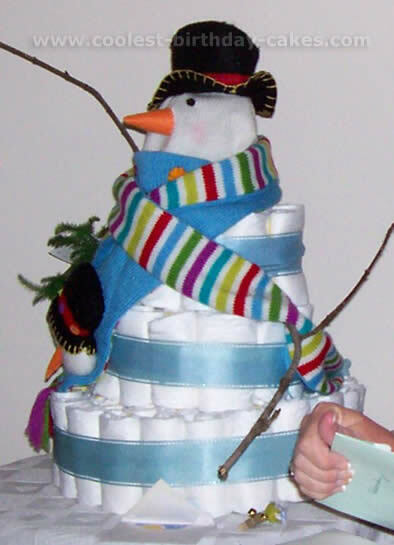 We made a snowman diaper cake. It turned out great. We used a snowman hat and scarf. We also used sticks from the yard for the arms. 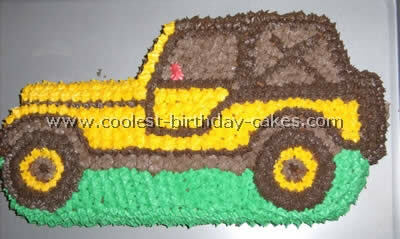 Even though this cake is not an edible cake, it is very handy! I was hosting a baby shower for a good friend of mine and decided to do decorations she could actually use. 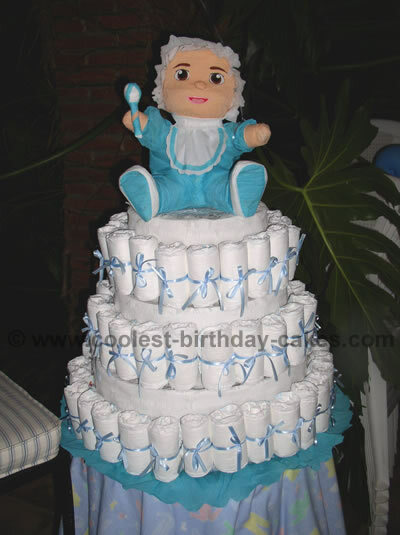 So I had someone who works with crafts do the baby on top and the layers of the cake out of cardboard and cover them with paper mache. I bought 2 packs of diapers and rolled them up, tied them with ribbons and glued them with a glue gun around the layers. The cake turned out so cute! The best part is that she could actually use the diapers! For the bases of this diaper cake I used a 12in, 10 in, 8in cardboard cake plates. I wrapped them in pink tissue paper. I used about 50 newborn diapers. I rolled them up and put a clear rubber band (Goody children’s hair band) on each. On the top I used a baby bottle and wrapped it in white and pink polka dot fabric. The ribbon is pink and white polka dots. I wanted a unique centerpiece for my sister’s baby shower. I started out just planning to make a simple little diaper cake, but as I started I kept adding and before I was finished it had a great deal of the things she would need for a new baby. First you want a base, something like plastic or wood that won’t bend. You could use cardboard if you are very careful when you lift it. Cut your base into the shape of your bottom layer. I used one package of newborn diapers and 1 ½ packages of stage 1 diapers. I rolled every diaper and tied a piece of ribbon around it. This is the most time-consuming part of the diaper cake. I then stacked them standing upright and tied a ribbon around them, making 4 layers of them. I did not attach my layers together just stacked them, it made it a lot easier to transport and carry. I then decorated it with hooded bath towels around the bottom layer and little socks I made to look like flowers to put where my ribbon met. Next, I just started adding stuff all around the cake. I just slid whatever I was decorating it with under the edge of the ribbon I had used to hold all of the diapers together with. I put baby washcloths, bibs, baby wash, baby shampoo, baby powder, Desitin, nail clippers, lacey socks, rolled up receiving blankets, alcohol and more. The only thing on here she couldn’t use was a couple of tiaras I stuck in between the layers. Other than that she could use the whole thing. The only thing is that she didn’t want to take the diaper cake apart. 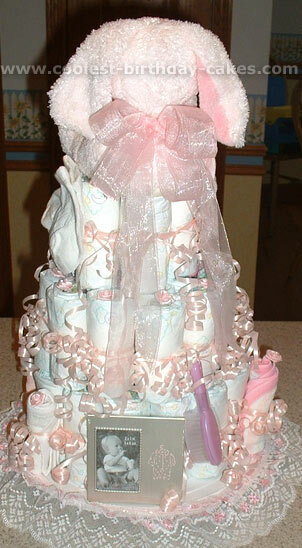 I made this diaper cake for my niece’s baby shower as a centerpiece for the food table. 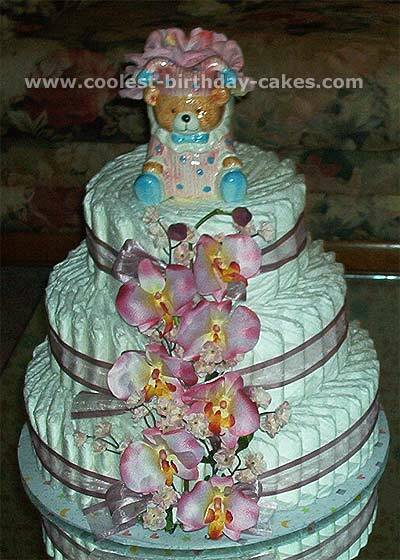 I used a pack of 56 diapers, pink ribbon, rubber bands, baby items, a stuffed pink bear, artificial miniature roses, a baby bottle, a silver platter that I had received from a submarine sandwich shop when I ordered a party platter, some lace glued to the platter and some white double-stick tape. 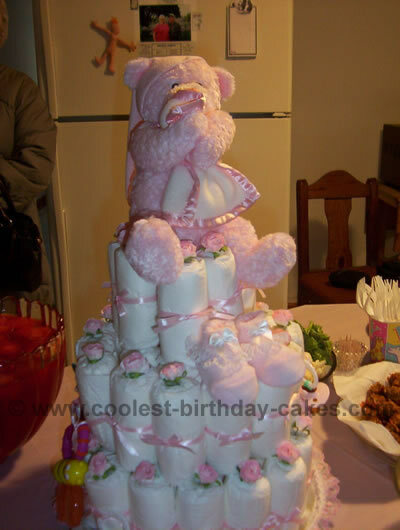 The bottom layer of the diaper cake consisted of 32 diapers. The middle layer consisted of 17 diapers, and the top layer had 7 diapers. The diapers were unfolded and rolled from end to end. The diapers that showed were tied with pink ribbon, and the rest were secured with a rubber band. I first made the middle and top layers and had a baby bottle with double stick tape around it in the middle of those layers to fill in space and to make those layers more sturdy. 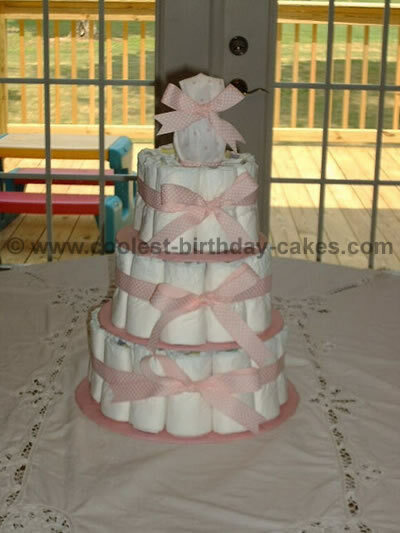 The diapers were attached to the diaper cake platter with double stick tape. When I stacked the middle and top layers onto the "cake" I also attached double stick tape (so that it wouldn’t show) below those layers. It is also helpful to use double stick tape throughout the layers of the diaper cake to help sturdy it for travel. The finishing touches were the pink miniature roses, and attaching pacifiers, teethers, rattles, spoon and fork set, baby booties, and pink bear. It was placed in gift basket wrap with a large pink bow tied around the top to close it. 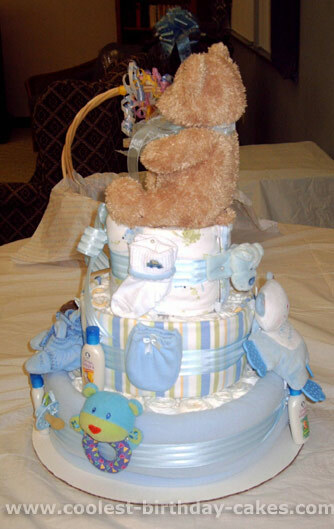 Everyone enjoyed this very different diaper cake centerpiece, and the best part is, all of it was useable! 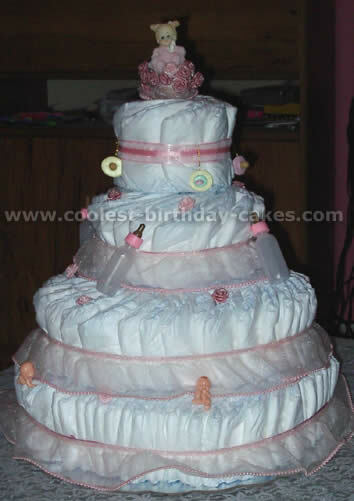 I used a pack of 56 diapers on this diaper cake. It was the first diaper cake I have ever made. I used a large baby bottle as the base (bottom layer). I wrapped 3 layers of diapers. Next I wrapped 2 rows of diapers on top of the bottom layer. The top layer I used a small baby bottle and wrapped two rows of diapers on this one. I opened the diapers up and rolled them. I used clear small rubber bands to secure each diaper. I placed the stuffed animal on top. Around each layer I tied a wire edged ribbon and placed small rose buds in each diaper on the outside row of each layer. 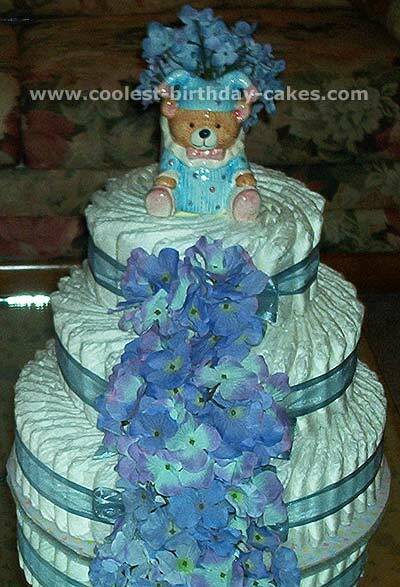 Diaper Cakes come in a two-tier and three-tier centerpiece design with one and a 1/2" silk edged organza ribbon keeping each tier in place along with a matching silk bouquet on the cakes front. 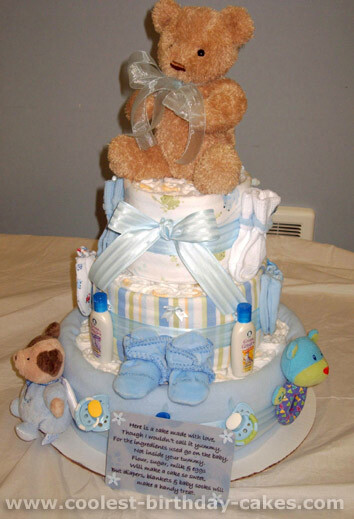 Each diaper cake is topped with a beautiful ceramic baby teddy with blue or pink pajamas. 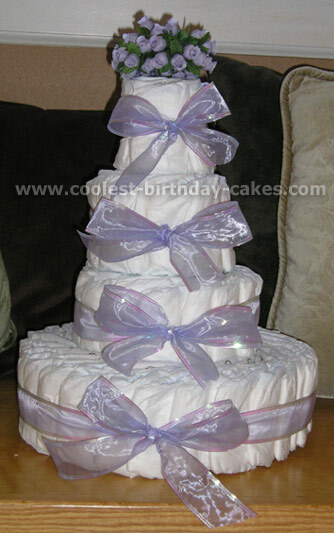 All 3-tier cakes measure 16" wide by 16" tall and feature 102 Pampers Swaddlers Diapers. I made this diaper cake as a gift for my sister’s baby shower. I used two mega packs of size 2 pampers swaddlers, 2 receiving blankets for the top two tiers, 1 fleece blanket for the bottom tier, diaper pins, glue dots, rubber bands, baby socks, mittens, booties, toys, a musical bear for the top, and sample size baby wash. 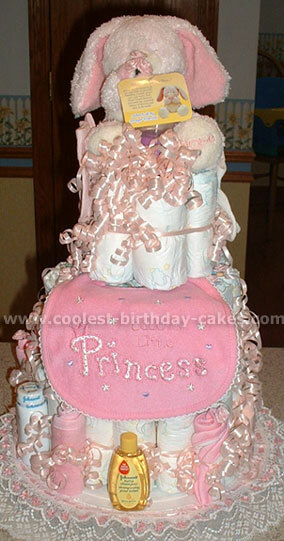 This was my first diaper cake. I used a 56-pack of newborn diapers and small squares of double-stick tape. It took a while to get the hang of it, but I wrapped them around a round candy box on the bottom and a sippy cup on the top 2 layers. I used lavender ribbon and fake flowers from the craft store to match the colors of the baby shower I was throwing. I put it by the guest book, and everybody loved it! I will definitely do it again. 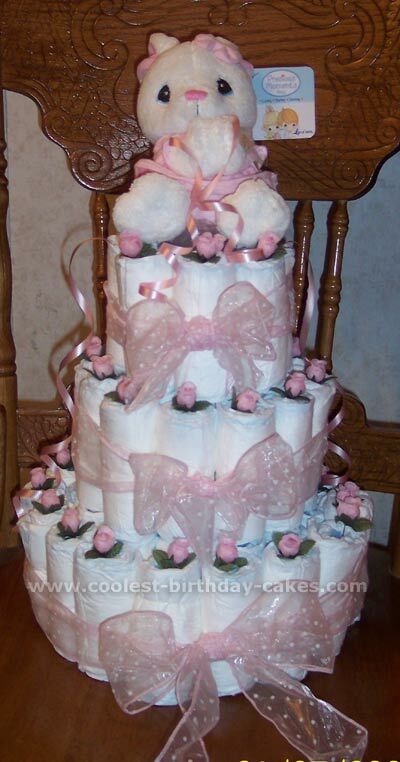 I used one package of size 2 diapers and rolled each one up and tied with curling ribbon for this diaper cake. Next I made layers of the "diaper cake" and tied with curling ribbon. 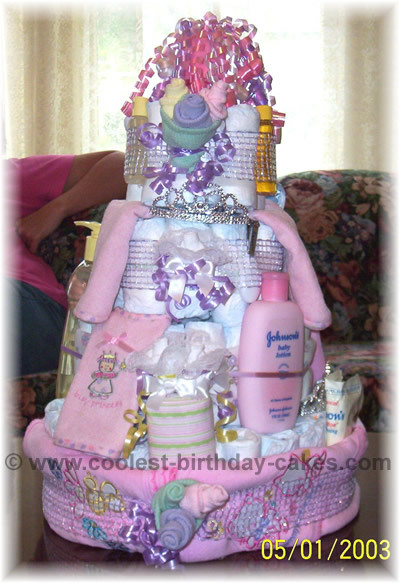 I added the baby items – shampoo, lotion, baby powder, bib, hairbrush, washcloths, baby socks, photo frame, and stuffed toy for the cake topper. 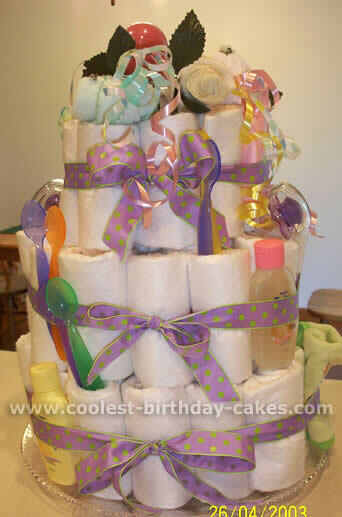 At the end, I added more curling ribbon to make it look fuller and little flowers on the top of the rolled diapers.